HAHNVILLE – The latest track for Tropical Storm Gustav takes the storm onshore over Terrebone Parish early Tuesday as a powerful Category 3 or 4 hurricane. While St. Charles Parish officials are extremely concerned about storm surge flooding on the West Bank of St. Charles Parish, the entire parish remains at risk. All residents should be taking steps to secure their homes and prepare for evacuation NOW. Parish President V.J. St. Pierre Jr. is working with all parish departments, which today are helping coordinate the parish’s assisted evacuation plan. Officials are planning to call a MANDATORY EVACUATION for all residents of St. Charles Parish SATURDAY AT NOON. All protective actions will be taken in accordance with the timeline set by the Governor’s Office of Homeland Security and Emergency Preparedness. The assisted evacuation began this morning and will continue through tonight with school bus pickups for those residents who do not have transportation out of the parish. If you are signed up with this plan, expect a phone call from the parish with further instructions by the end of the day Saturday. Those with pets MUST bring pet supplies, including a CARRIER. Please note that St. Charles Parish residents who have not signed up with this plan ahead of time WILL NOT be able to utilize the Avoyelles Parish shelter designated for this group. This is not a public shelter. If you will need assistance, call EOC IMMEDIATELY at (985) 783-5050. Please note, if you are signed up for this service, you MUST leave when told to ensure a safe and orderly evacuation. Emergency Operations personnel is now contacting special needs evacuees with information on evacuations beginning this afternoon via ambulance. If you or someone you know requires medical special needs evacuation, call the St. Charles Parish EOC IMMEDIATELY at (985) 783-5050. If you have transportation but do not have a place to stay, the state of Louisiana has set up public shelters you may utilize. For a list of information checkpoints on these shelters, visit http://www.stcharlesgov.net/hurricane/stateguide.htm. A mandatory evacuation of St. Charles Parish is planned for NOON SATURDAY. Officials are STRONGLY ADVISING residents to leave before this time on a voluntary basis to avoid traffic congestion. Contraflow should begin as early as 6 p.m. SATURDAY, according to State Police. This includes both southeast and southwest Louisiana. At this time you will only be able to get as far as Gramercy on I-10 heading back into St. Charles Parish. Residents are strongly advised NOT to attend the LSU football game if it is held as scheduled. Garbage pickup will run normal routes through Aug. 30. Any residents planning to leave due to Gustav must secure their garbage can before leaving. Coastal Waste Services will not be held responsible for replacing any missing containers. Any route changes for Sept. 1 and 2 will be posted on the parish Web site and Channel 6 as it becomes available. The parish continues to seek volunteers willing to drive buses during the assisted evacuation. No commercial driver’s license is necessary. Please call EOC at (985) 783-5050 if you can help. Please continue to clear out catch basins and ditches on and near their property to ensure proper drainage. Re-entry guidelines for business owners and residents are available through Louisiana State Police at www.lsp.org under ‘Hurricane Information.’ The parish is not issuing re-entry passes. Residents should be sure they have a driver’s license with proof of residency during re-entry. The St. Charles Parish Animal Shelter is now closed indefinitely. Please call EOC at (985) 783-5050 for any animal-related emergencies. The West Bank Bridge Park is now closed. All cars parked overnight in the parking lot will be subject to towing. Please refer to the St. Charles Parish School Board Web site at www.stcharles.k12.la.us for information about school closings. Residents should take alternate routes to leave the parish. Once contraflow begins, Interstates will become difficult to travel, and I-310 will only be open between the Luling Bridge and Airline Highway. To view an evacuation map, visit www.stcharlesgov.net/hurricane. Sign up to receive e-mail updates throughout any storm event by sending your e-mail address to channel6@stcharlesgov.net. 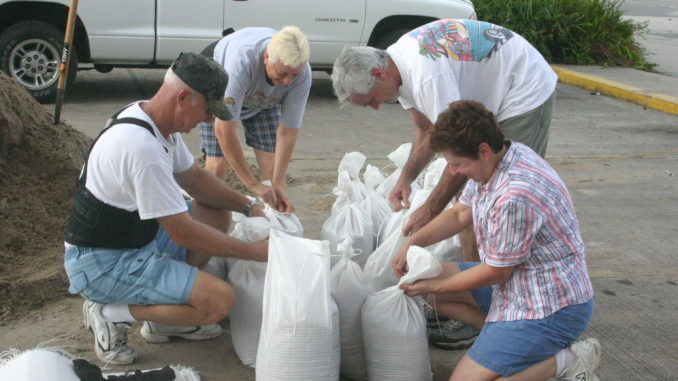 Residents should bring their own shovels for sandbags, which are available at 37 locations around the parish. For a complete list of locations, visit www.stcharlesgov.net/hurricane. St. Charles Parish residents are urged to stay tuned to Cable Channel 6, www.stcharlesgov.net and 1370 AM for additional updates.